Ahmed Gaddafi al-Dam, formerly one of Gadaffi’s most trusted security chiefs, estimates a minimum of 500,000 migrants will make their way from Libya to Europe in 2015, as the Islamic State [IS, formerly ISIS/ISIL] increases its foothold in the North African state. “There are many terrorists among them, between 10 and 50 in every thousand,” he told the Mail Online. The former security chief made the remarks in Cairo on Monday, during an interview with the newspaper. He has reportedly since fled. Following his comments, Britain’s Home Secretary Theresa May said Britons continue to face the risk of a terror attack. She added everyone in the UK needs to play their part to help fight the spread of radicalization. Considered alarmist by some, Gaddafi al-Dam’s warning will likely alarm Western governments. Following the brutal massacre of 21 Egyptian Coptic Christians by IS militants in Sirte, northern Libya, concern is mounting that instability in the region poses a risk to the West. Militants linked to IS have made gains in Libya in recent times, and are thought to have conquered three towns, including Sirte. Gadaffi’s cousin says the Islamic State in Libya could be in possession of over 6,000 barrels of uranium, previously guarded by the state’s armed forces. “They are not stupid anymore. They know how to make money. They will try and sell it,” he added. Colonel Gadaffi’s family has remained largely out of the media spotlight since the Libyan dictator’s death during the state’s 2011 revolution. 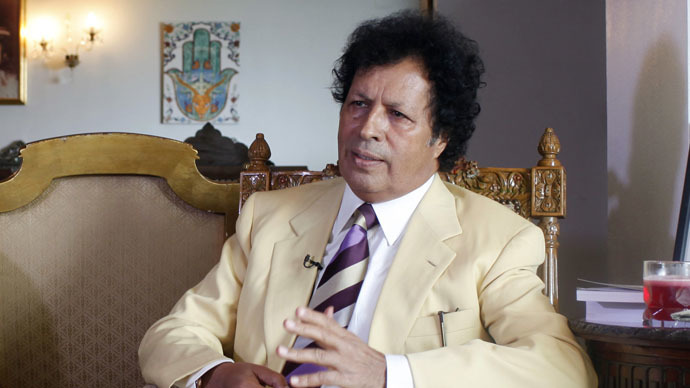 Gadaffi’s passing marked the end of his 42-year reign as state leader. Rival insurgents have battled for power ever since, ousting Libya’s internationally recognized rulers from the state’s capital and sparking fears of a full-blown civil war. Last month, Britain’s ex-director of MI6 Sir John Sawers called for a debate about UK military intervention in Libya. Sawers said the country has descended into “growing chaos” after Britain joined US airstrikes to bring down Gaddafi's regime. However, Foreign Secretary Philip Hammond has rejected calls for military intervention, insisting a political solution must be found to Libya's struggle against the Islamic State. Hammond stresses efforts to install a national unity government will help Libya in its struggle against terror groups. Libya has remained restless since the demise of its autocratic ruler in 2011. After the uprising, sharp political divisions surfaced in the country, yielding two opposing governments each of which runs its own institutions and armed forces. The separate parliaments, located in the eastern city of Tobruk and Libya’s capital Tripoli, currently vie for supremacy. Since Libya’s 2011 uprising, accompanied by NATO airstrikes, critics argue the state has been abandoned by the West and left without any foreign assistance to foster stability. There has been no attempt to manage a transition to a new system of rule, as Western allies did in the case of Iraq and Afghanistan. Following the release of a video depicting the brutal beheading of 21 Coptic Christians in Libya earlier this year, the Egyptian government launched airstrikes against IS targets in the region. Libya has also appealed to the UN Security Council to lift its arm embargo, in a bid to counter threats from the Islamic State and other militants.